The Solihull Medical Cosmetic Clinic offers the latest in facial contouring especially for Asian faces by leading specialist Dr. Sagoo. In the last ten years, there has been an increasing demand on aesthetics for the Asian face. The V-shape or slim face is considered by many Asian women to be aesthetically more attractive and younger in appearance. Face slimming has become increasingly more requested in the Asian culture. Muscle relaxing injections are usually the first choice for facial slimming treatments. There are several steps involved and facial shaping using muscle relaxing injections is an advanced treatment that requires special skill. Muscle relaxing injections may also be used to help lower the chin area. Another non-invasive approach that may help to achieve the V-shaped face is to use injectable fillers. This may help to define cheek bones and lift the mid/lower face. The most frequent request is to fill the hollow bridge of the nose so that it looks more in keeping with the rest of the face as well. To many people, especially women, an overly square or prominent jaw line is unwanted. Cosmetic jaw line contouring can be performed to help make the jaw line less prominent, and may give it a softer appearance. What causes a square Jaw line? People who have an enlarged masseter often have a square jaw line. The masseter is a muscle located in the jaw, responsible for moving the jaw when people clench or chew. Some personal habits, such as excessive chewing of hard foods, or grinding teeth can cause a noticeable enlargement of the masseter muscles. The use of cosmetic injections for jaw line contouring has been shown in research to relax the masseter by blocking nerve impulses to the masseter so that the masseter will gradually shrink. This may narrow the lower face, and soften the appearance of jaw line contour leading to a slimmer face. Noticeable results may appear within two to four weeks after the treatment. The contouring effects of muscle relaxing injections around the jaw line may last a little longer than that of forehead cosmetic injections, as the jaw line volume takes longer to return. The slimming effects typically lasts from four to eight months, though in some cases the results may last up to one year, depending on the individual. 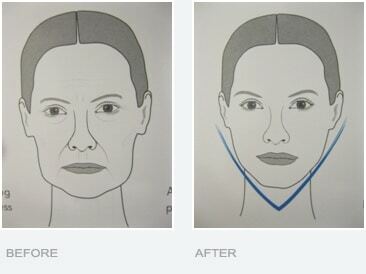 Wide jaw line – Facial slimming with muscle relaxing injections. Dr. Sagoo has a vast experience of treating Asian skin and faces, he will assess clients faces and using a combination of injectable fillers and muscle relaxing injections may create a slimmer and much more aesthetically pleasing appearance. For further information on this exclusive advanced non-surgical treatment please contact us on 0845 603 6150.